This error occurs if the server administrator does not have permissions to the local security policy on Microsoft Windows 2008 server. 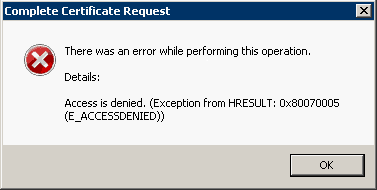 Although the error occurs during installation, the certificate might still install successfully. Check the bindings to see if the new certificate is available to be assigned. If the SSL certificate is not in available in the bindings list then proceed with the below instructions to set the appropriate permissions. DCOM: Machine Access Restrictions - Add Anonymous, Everyone, Interactive, Network, System with full rights options set. Enter DCOMCNFG and press OK. This will open the DCOMCNFG window. Add "Anonymous", "Everyone", "Interactive", "Network", "System" with Local and Remote access permissions set. The following solution describes how to resolve the permissions issue using a workaround of installing the certificate without using the Complete Certificate Request feature IIS 7.